Food and beverage giant PepsiCo is to trial self-driving robots for the purpose of delivering food, beginning with deliveries on the campus of a California university. The company is beginning to offering a robot delivery service for students at the University of the Pacific in Stockton, California which has 5,000 students. Students have a choice of snacks and drinks from PepsiCo’s ‘Hello Goodness’ range, which is targeted towards more health-conscious consumers. The range includes Baked Lay’s (potato crisps), SunChips (multigrain crisps), Smartfood Delight (popcorn), Bubly sparkling water, Lifewtr (water), Starbucks Cold Brew brands of coffee and Pure Leaf Tea. Anybody with an official University of the Pacific email address can order food and drink using a dedicated iOS app, then go to meet the delivery robots at one of more than 50 locations on campus between 9am and 5pm. 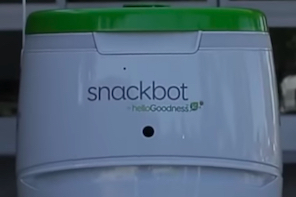 According to PepsiCo, robot delivery could offer its customers a more convenient way of buying snacks on their phones, rather than having to physically look for food and drinks. The company said that the service is designed for students with an “on-demand snacking mentality”. The robots are squat, metre-tall six-wheeled vehicles wielding flags, with a similar appearance to other food delivery robots. They weigh 36kg, travel at a maximum speed of just under 10km/h and have an operating range of more than 32km per charge. According to Robby Technologies, which designed the robots, they are entirely self-driving and pause when a person steps in front of them. The robots are equipped with cameras and headlights, which provide good visibility even in darkness and rain, and are capable of handling curbs and slopes. The three-robot team will increase eventually to a team of five. Three employees based on the campus will be responsible for refilling the robots with crisps and drinks and replacing the rechargeable batteries when necessary. A number of other companies have been experimenting with delivery food and beverages without human worker. Retail giant Walmart has expressed an interest in offering drone delivery to its customers, and in December, US supermarket chain Kroger announced that it would begin testing the delivery of groceries using a driverless vehicle in Arizona. However, ground-based delivery robots – such as those experimented with by PepsiCo and Just Eat – have attracted criticism during trials due to their congesting of pavements in both the UK and the US.